Bestselling author of WHY Do They Act That Way? Dr. David Walsh writes the book his readers have been asking him for: how and when to say no to your kids—and make it stick. No. It’s not just a one-word answer, it’s a parenting strategy. By saying no when they need to, parents help their children learn skills, such as self-reliance, self-discipline, respect, integrity, the ability to delay gratification, and a host of other crucial character traits. Although the importance of no should be obvious, many parents have a hard time saying it when other parents and the culture around them are being permissive, even when they know they should. 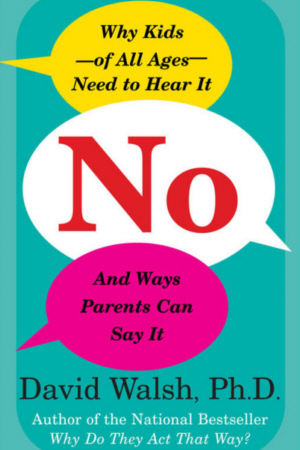 Now renowned psychologist Dr. David Walsh provides parents with an arsenal of tactics, explanations, and examples for using no the right way with their kids. By applying these techniques, parents will regain confidence in their own judgment and ability to say no. Dr. Walsh explains that regaining the ability to say No is not only important for our kids’ well-being but essential for our country’s economic future. Other parenting books broach the topics of tough love and discipline, but only No offers the lively voice, warm wisdom, science made simple, and breadth of knowledge that readers have come to expect from Dr. Walsh. With down-to-earth advice that can be put into practice immediately—and affecting and humorous anecdotes to illustrate central points and remind readers that they’re not alone—No gives parents real, effective strategies for helping their children grow up healthy and happy. David Walsh, Ph.D., is one of the most sought-after speakers in American education. President and founder of the National Institute on Media and the Family in Minneapolis, he is an award-winning psychologist, author of seven books, television personality, and the subject of a nationally televised PBS special, Raising MediaWise Kids.